Links to other dolphin groups and our sponsors. www.seawatchfoundation.org.uk We are Yorkshire Regional Co-ordinators for the SeaWatch Foundation, a registered charity which aims to improve the conservation of whales, dolphins and porpoises in the seas around Britain and Ireland by involving the public in scientific monitoring of populations and the threats they face. You can get involved by reporting sightings from around the UK coast or joining the excellent Adopt a Dolphin programme. Contact robin@dolphinspotter.co.uk, who is also the Sea Watch Foundation Chair of Trustees, for more information about how you can get involved anywhere in the country or about joining us for whale and dolphin surveys in Yorkshire. www.idw.org IDW was established by Dr Horace Dobbs in 1978 to study and gather information about dolphin encounters in the wild. Access the online colour magazine "Dolphin" which includes articles about projects and campaigns around the world and information about opportunities to help with these and also experience close encounters with wild dolphins. 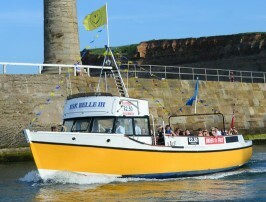 www.whitbycoastalcruises.co.uk The EskBelle III is Whitby's biggest trip boat carrying up to 60 passengers. Trips last from 20mins, starting at 10.30 am, throughout the day - early ’til late. Trips depart from a boarding pontoon located at the Brewery Steps opposite the Lifeboat Station and sometimes encounter harbour porpoise and other wildlife. Longer trips are alos available. www.bdmlr.org.uk The Dolphinspotter team are also Marine Mammal Medics and part of the UK strandings network for whales, dolphins, porpoises and seals. Log on to their website for news and information about how to become a Marine Mammal Medic volunteer and help to rescue sick, injured or stranded marine mammals or to report a stranded animal. www.ambassador.is If visiting Akureyri, Iceland, there is no better way to spend your time, than taking a trip with this superb whale watching company. I can honestly say, that this was one of the best trips I have taken anywhere! A great boat (very sensitively handled), superb commentary, ongoing research, stunning scenery and 12 very active humpback whales busy feeding often very close to the boat. A minke was also seen and dolphins and porpoises can also be encountered. The waters are more sheltered than at Reykjavik and recently, sightings have been better than at Husavik which has traditionally been the centre of the Icelandic whale watching industry! Please do let them know we recommended you, and let us know how you get on! If visiting Madeira, a fantastic way to see the local dolphins and whales is with one of this company's two large catamaran sailing boats. Both boats have toilets and a bar serving snacks and drinks and the boats are handled very well when animals are close. We have had great experiences with this company and they even offer a free trip if you don't see anything! Have a look at the website and please let them know we sent you and let us know how you get on! Moray Firth Wildlife Centre Originally opened by our Sailingwild partner, the centre is now operated by the WDCS and remains a good location to observe the behaviour of the dolphins which frequent Spey Bay in the Moray Firth. This is one of the bases for dolphin researchers in the area. There is also an excellent visitors centre, shop and cafe. Take a walk along the banks of the River Spey, and watch for the ospreys and other wildlife in the area. 6000+ animal groups listed with information and 1200+ web-site links! for their sponsorship and support. Sponsors and providers of our excellent mobile telephone and connection. 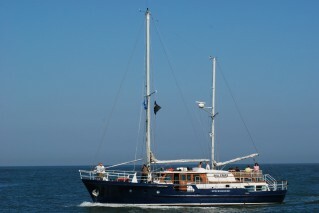 Specialists in boat insurance and offering excellent cover and service from the very beginning of our work. Suppliers of the superb Rutland 913 wind generator, a solar panel and power regulation equipment to Dolphinicity.